We had to shop. I needed to get toilet paper and other essentials. At the time, I had two of my oldest kids with me, who were then four and two years old. It was the usual challenge, but nothing I couldn’t handle. Little one in cart, big one following next to me in the store. We went to Target, the store we visited at least once a week. It was really busy: parents and grandparents scrambling to get things for Easter, others there to get their essentials, like me. While the kids were still okay, I decided to do all I could while I was there: essentials, Easter shopping, a bit of food and other items. I swiftly went from aisle to aisle, knowing that the clock was ticking and the little one would need a nap soon. Time was precious. Time was everything. I was able to get to the last section of the store, the section before the registers. Just as I was picking an adorable tooth brush for my daughter’s Easter basket (yeah, I’m practical like that), the volcano that is my sweet little daughter erupted. The venomous spewing of pure toddler rage flooded the small space of the aisle we were in. She wanted that toothbrush NOW, but I put it in the cart. I knew the shopping trip was over. Time to get out. There comes a time in every parent’s life when their beloved child turns into a monster. Unfortunately, it generally happens in public and at the worst possible moment. 1.) Don’t overreact. Public temper tantrums pull the spotlight on you and your parenting skills. At least that’s how it seems. However, reacting to the spotlight and the pressure to get your child under control can make things worse. Focus on helping your child and ignore the other shoppers or restaurant customers. Are people going to stare or start whispering? Sure, but ignore them as best you can. Remember: it’s about you and your toddler. You need to focus on what’s best for your child at that moment. 2.) Speak in a calm, quiet voice. Raising your voice accomplishes two unproductive things. It draws more attention from people around you. Additionally, it may trigger your child to dig in even deeper into their temper tantrum. Your reaction is exactly what they’re trying to get. Speaking in a calm, quiet voice forces them to calm down to listen to you. It helps get the message through to them and your words stay private between you and your toddler. If you can, get down to the toddler’s level and make eye contact. Being on the toddler’s level can help him or her feel calmer, safe, and perhaps more willing to listen to you. 3.) Don’t give in. It’s tempting to buy your child the item they’re having a fit over just to quieten them down. However, taking this action will only reinforce the behavior and turn every public outing into a debacle. 4.) Avoid the tantrums in the first place. Children are prone to temper tantrums when they’re feeling out of sorts. They might be hungry, tired, overstimulated or bored. If you can avoid it, don’t take your child out in public when they’re tired or hungry. If they’re overstimulated, find a way to engage them in one focused activity – singing for example. This is the perfect tip for when you’re going to be going to visiting a place that may be busy and cause over-stimulation, like when you take a toddler to Disney or an amusement park where there’s a lot going on. It’s best to be prepared as much as possible to avoid any tantrums in these places. 5.) Give your child choices. 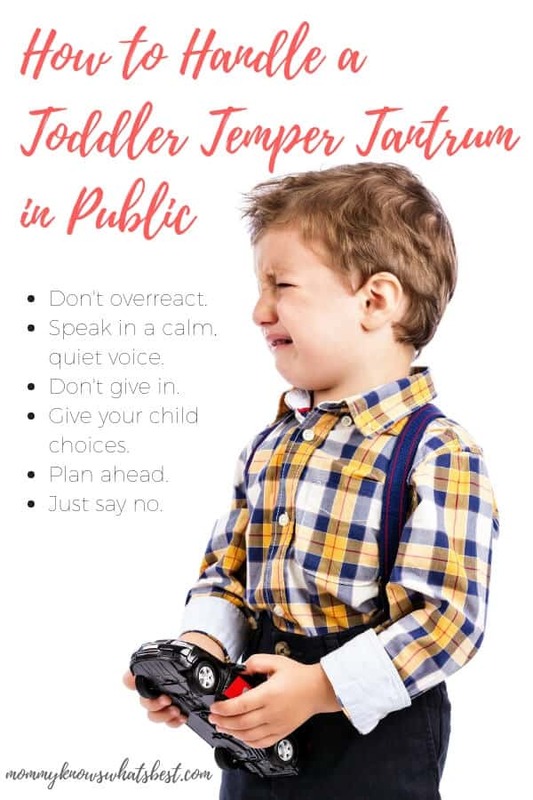 One way to avoid public temper tantrums is to involve your child in the decision-making process. Give them decisions to make. For example, what kind of soup should we buy? Do you want hamburgers or spaghetti for dinner tonight? Giving them decisions helps them feel like they’re part of the process. They’ll be less inclined to have a breakdown. 6.) Plan ahead. Before you get to the store, explain your expectations clearly. Let them know that you’re not buying any extras today and to not ask. However, they can choose their breakfast cereal if they behave. Planning ahead is essential, especially when you’re bringing little kids shopping. 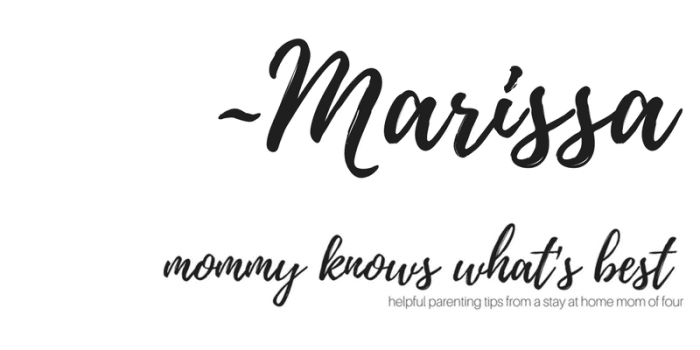 In fact, planning ahead is one of my tips for how to survive a shopping trip with kids. 7.) Just say no. Children like to test your limits. They’ll ask for something from the store even if you’ve told them in advance that you’re not going to buy anything today. Stick to your guns and tell them no. Remind them of your expectations and the choice or reward they get if they behave. Public temper tantrums are embarrassing and pure torture when they’re happening. If you cannot get your child to calm down in the store, don’t hesitate to leave your cart behind, pick up the child and remove them from the environment. It sends a strong and powerful signal to your child that you’re not affected by their behavior and it’s not going to be tolerated. Remember the venomous spewing of pure toddler rage that erupted from my toddler? The little one scrambled to get out of the cart as I was pushing it, upset that I didn’t immediately hand her the toothbrush. My son kept lagging behind, not really wanting any part of what was going on. I was just trying to get out of the store as quickly as possible, which was impossible as I approached the very busy registers. As I waited in line, the little one upped the toddler rage. Gee. Thanks. Me? Embarrassed by all of you staring at me during a very normal toddler explosion of rage? Noooo. I took the little one out of the cart. She immediately quieted. I spoke to her in quiet tones, explaining that I had to pay for the toothbrush first before we could bring it home. I reminded her that when we got home, she could play with her blocks and have tons of fun with her big brother. That was enough for her, and she settled onto my shoulder. How Did You Handle a Toddler Temper Tantrum in Public? Have any stories to share? 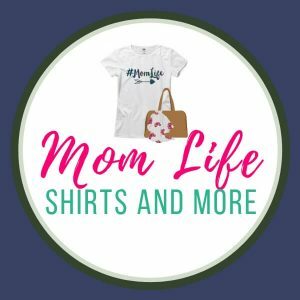 What helped you when your toddler melted down in public? Leave a comment below!